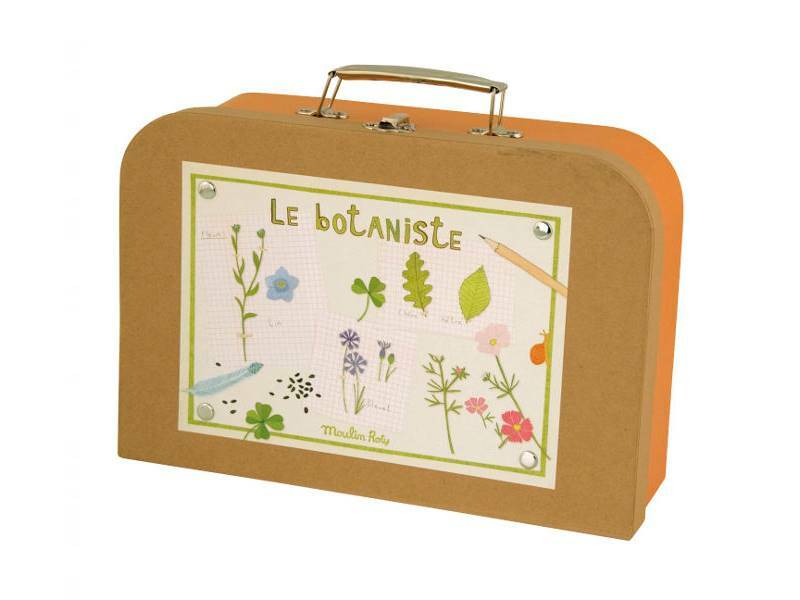 This beautiful vintage inspired Botanist Case by French toy maker Moulin Roty is perfect for little ones who are interested in plants. Made to encourage a love of gardening and nature in kids, the sweet little Botanist case comes packed with fun items, such as three specimen boxes for storing seeds, dried leaves and other treasures, a lovely natural wood flower press, small pair of scissors and a magnifying glass. There’s even a cute notebook and pencil included so your child can record her nature adventures. Everything comes neatly organized in a gorgeous case with a metal handle and is travel-ready for a trip to the woods or neighborhood park.The case and contents meets or exceeds safety specifications set forth by ASTM International (American standard) and the BSI (European standard), but due to small parts is only suitable for kids 6 years or older. This beautiful vintage inspired Botanist Case by French toy maker Moulin Roty is perfect for little ones who are interested in plants. Made to encourage a love of gardening and nature in kids, the sweet little Botanist case comes packed with fun items, such as three specimen boxes for storing seeds, dried leaves and other treasures, a lovely natural wood flower press, small pair of scissors and a magnifying glass. There's even a cute notebook and pencil included so your child can record her nature adventures. Everything comes neatly organized in a gorgeous case with a metal handle and is travel-ready for a trip to the woods or neighborhood park.The case and contents meets or exceeds safety specifications set forth by ASTM International (American standard) and the BSI (European standard), but due to small parts is only suitable for kids 6 years or older.